In Expanded, the format is a little more open. Garbodor Toolbox is the dominant deck there, but there are decks that can beat it, and rumors abound of a potential Dimension Valley ban that would nerf the deck (we'll know for sure on October 20th with TPCI's quarterly ban list announcement). 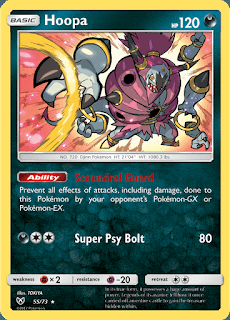 The "Student Loans" deck (Tapu Koko/Necrozma-GX/Dusknoir") is proving it's more than just a gimmick, with strong results including a win at the Daytona Regionals League Cup. 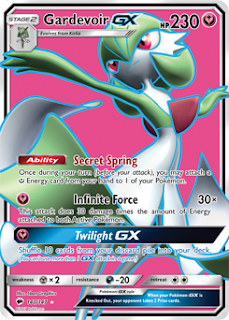 As BRT-BSH drew to close with a Top 4 containing 3 Gardevoir-GX (which Pablo Meza took to 1st place) Sunday night in Vancouver, it was clear that not only was Gardevoir the top deck, but there were only a handful of other viable decks. 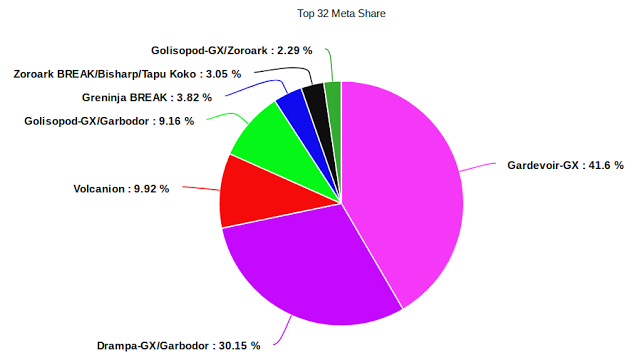 If you exclude Gardy and the two "pet decks" (Alex Koch's Zoroark BREAK/Bisharp and Aaron Tarbell's Golisopod-GX/Zoroark) from Vancouver's Top 32, only 4 other decks managed to crack Day 2: Drampa-GX/Garbodor, Volcanion, Golisopod-GX/Garbodor, and Greninja BREAK. 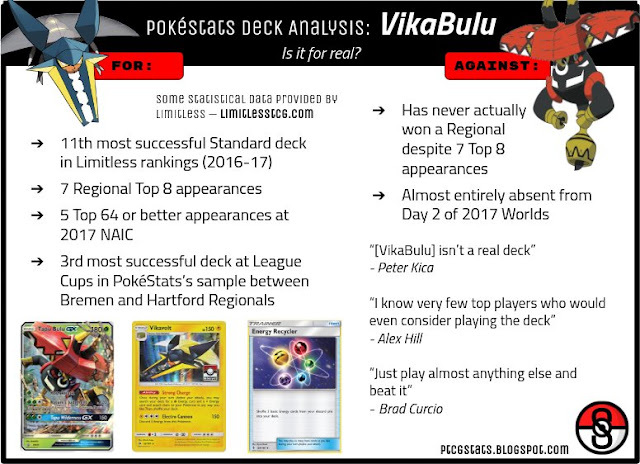 Last month I tweeted the infographic above detailing the Bulu debate and including some quotes from top players regarding the deck. 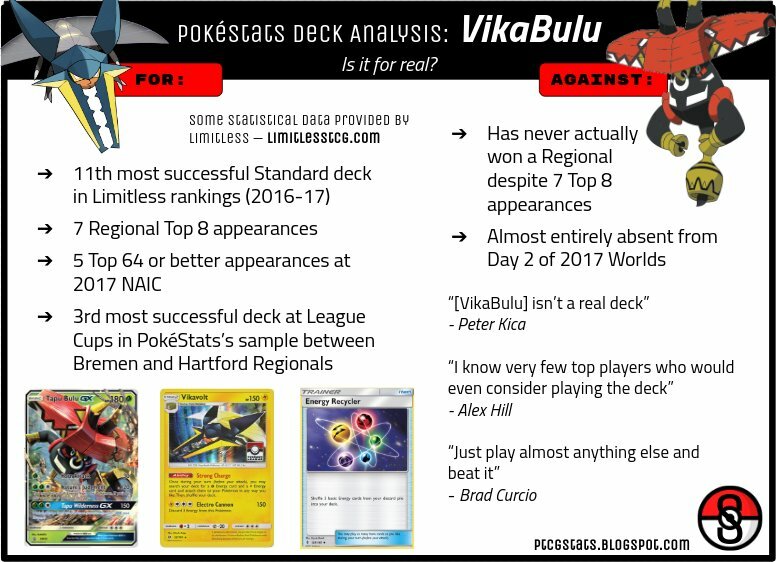 The most logical explanation for the Bulu phenomenon is that the deck is fundamentally strong and has the ability to win small tournaments like League Cups, but lacks the consistency to succeed at larger tournaments. However, it's highly possible Roberts's list, which emphasizes consistency to an almost ridiculous extent, could change this narrative. Only time will tell. Let's move past Bulu for now and discuss the other top decks. 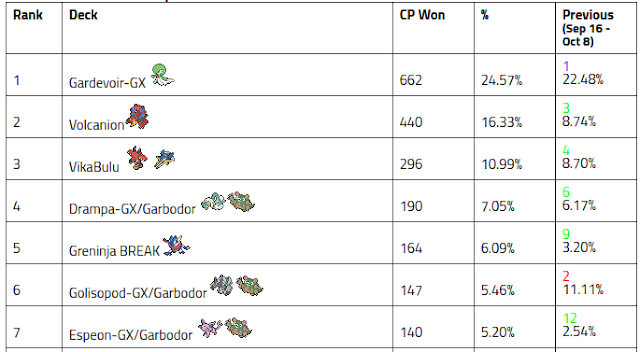 Volcanion and Drampa-GX/Garbodor are still very strong, and each managed to win at least one Cup. Golisopod-GX/Garbodor fell in the Cup rankings and didn't perform incredibly in Vancouver, but remains a respectable play. The biggest movers in the Top 10: Greninja BREAK (+4), Espeon-GX/Garbodor (+5), and Solgaleo-GX/Rayquaza (+5). As always, the Cup Sample deck rankings are under the "Cup Statistics" tab at the top of the site. Normally I don't ask the Panel about Cup predictions - they have better things to do - but given that this weekend will showcase a new format, I didn't have any statistical data to make predictions with, so I had nowhere else to turn. The general consensus is that, as Rahul Reddy summed it up, "Nothing changes tbh." Here's Mike Fouchet on the top 10 plays: "1. Gardy 2. Drampa, everything else is irrelevant." 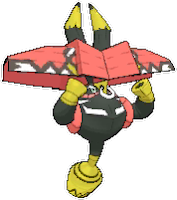 Jon Eng amended that list to put Greninja in first place, but concurred with the rest. 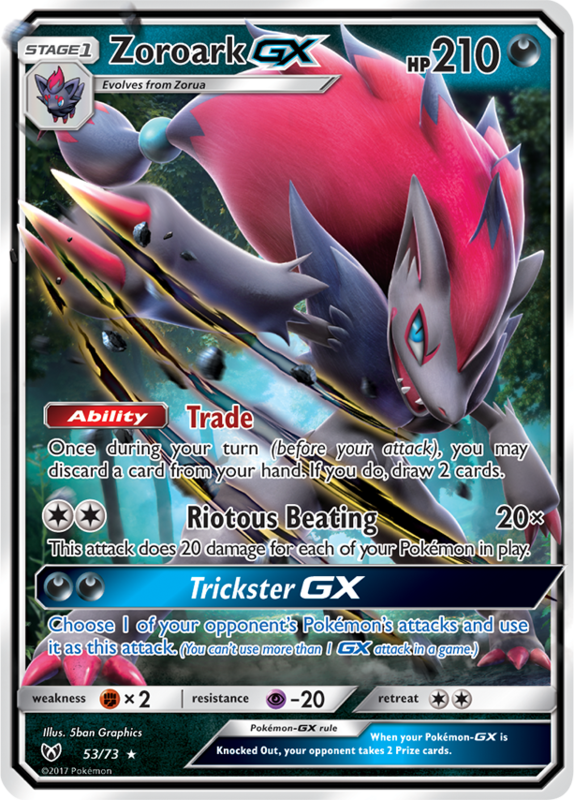 Zoroark-GX was the only new card really seeing hype. 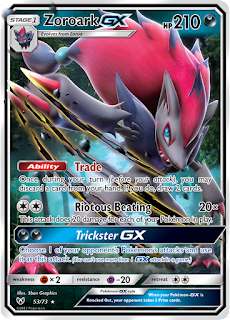 "There'll be a good Zoroark deck, not sure exactly what it'll look like," said Kevin Baxter. "It may also just get put in anything [that already contains] DCE." Here are two full Top 10 lists (for best Cup plays) for this weekend courtesy of two of the Panel members. I'll keep their names secret to avoid associating a player with a deck and possibly spoiling a surprise play. Interestingly, neither of these players chose to put Gardevoir-GX in first place, opting for counter decks instead. I was pretty surprised to see Volcanion completely absent from the first list, too. Zoroark-GX is seeing a fair amount of inclusions in these decks, but only two other SHL Pokemon are mentioned: Latios and Hoopa. Umbreon-GX/Hoopa is an interesting concept that seems like it could be annoying. I had to look up what the Latios did: for a DCE, 30 to the Defending Pokemon and 30 to 1 of your opponent's Benched Pokemon. It makes sense to pair that with Decidueye-GX: it's a slightly different Alolan Ninetales-GX that is a Basic worth only one Prize. Rising to the Above [SixPrizes] - Xander Pero discusses several "strong cards" included in Shining Legends. He notes that "Zoroark-GX is problematic for Garbodor, but won't eliminate Garbodor completely." A 6P Underground membership is required to read the article. A Closer Look at the Daytona Regional Finalist Decks and My Top 5 Favorites from Shining Legends [60cards] - Jose Marrero gives his favorite new cards from SHL. A 60cards premium membership is required to read this part of the article. Get Your Shine On! [60cards] - Caleb Gedemer discusses the "Pretenders, Averages, and Ballers" from the new set, gives a rundown of the new Standard format, and even shares some lists. A 60cards premium membership is required to read past the "Pretenders." Lull Before London, Part I [PokéBeach] - John Kettler reviews SHL alongside the upcoming Crimson Invasion and says "it's been a very long time since I've seen so many good cards released so close together." I'm not sure where John was during the three-month span that tied together Espeon-GX, Decidueye-GX, Tapu Lele-GX, Drampa-GX, Garbodor, Choice Band, Field Blower, and Rescue Stretcher (just kidding John), but this article is worth a read (if you have a PokéBeach premium membership).